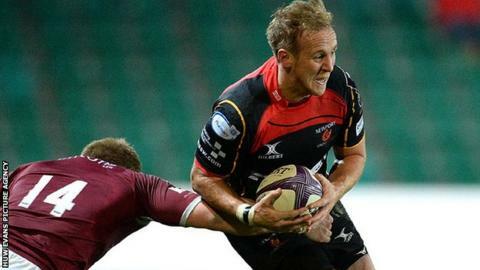 Dragons centre Ashley Smith faces a long lay-off after suffering a broken jaw in the Welsh region's 69-17 win over Bucharest Wolves. Smith, 27, suffered the injury in the opening minutes of the European Challenge Cup match at Rodney Parade. "The sad news is that Ashley has broken his jaw and has lost some teeth," said head coach Kingsley Jones. "That's a massive blow for us because he brings a lot to the midfield and we'll miss him." Smith underwent surgery the morning after the match to have plates put into his jaw. He is likely to be out for between eight to 12 weeks, according to the Dragons. The win over Bucharest - coached by former Pontypridd coach Lynn Howells - lifted the Dragons to the top of Pool Three, one point ahead of Newcastle Falcons. Dragons travel to face Newcastle in mid January, followed by a home game against Stade Francais in the final round of pool matches a week later. Before then the Gwent region face back-to-back derby matches with Cardiff Blues in the Pro 12 on Boxing Day and New Year's Day. Smith is likely to miss all of those games, but Jones remains confident about Dragons' chances of qualifying for the knockout stages of the Challenge Cup. "It all comes down to us beating Stade Francais at the end of it - whether we beat Newcastle or not," said the former Wales flanker. "I think two teams can go through from this group and we're in a good position to qualify, but we've got two huge matches left."